è It will summarize good practice examples in the field of volunteering. Each partner will produce one page/two pages description about good practices examples in its country (projects carried out in his own organization or in another organization). Translation in each national language. è What is the target group? People over 50s and organizations as well. è Each organization will make its own choices about the content of the good practices in their country. 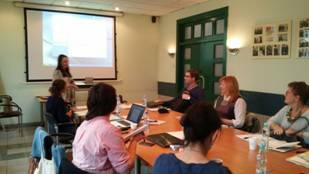 Ilona proposes we will choose the format during the 2nd project meeting in France. è The partners can share some good practices for the 2nd meeting in France and the partnership can talk about it. The preparation will be between June and September 2017. The final brochure should be ready in October during the meeting in Romania. During the meeting in Hungary, we will talk about the two questionnaires for survey polls and we will apply them before the summer 2017 between May and June 2017. Betka will summarize and analyse them during the summer. The initial content from the meetings in Hungary and Lithuania will be switched. Therefore, the workshop n° 3 will be organized in Lithuania but leaded by Hungarian partners. 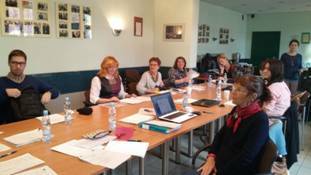 1) Assessment of the predispositions of the voluntary work: done during the meeting in France. Abilities? 1) Paris: 20th-21st-22nd of February: each partner has to decide regarding their flights and schedules. Final decision next week. Once ESE has the answer from all partners, they will send a list of accommodation. 2) Budapest: 19th-20th-21st of April? Final decision next week. 3) Vilnius: Povilas will send options for dates in June 2017 (ESE cannot the 2nd week of June). 5) Slovakia: the final meeting will be postpone to January 2018 – second half of the month (budget issue). è Task division and specific activities carried out by each national team were described in Section G of the Application form. - Detailed summary with financial and contractual rules - available on Dropbox. VLO recommends to analyse it carefully. - The final report, products and outputs will be assessed by the NA in accordance with a set of quality criteria; it is of a special concern for the partnership to develop high-quality results, as a grant reduction based on poor, partial or late implementation may be applied to the final amount of eligible expenses. The document with the quality criteria used by the NA will be uploaded on Dropbox by Ilona. - Application form provides some initial directions on how the expected impact will be measured (page 46-47). The partnership will collectively elaborate and agree upon the impact indicators- Ilona will analyze the information received from Povilas, and later – prepare an initial list with the adequate impact indicators; this should be amended by the other partners. - Questionnaires measuring the impact on the staff will be prepared by Ilona; Betka will give her feedback on it. - Dissemination activities held by each national team will be described in a sample table proposed by Ilona. Each team will conduct the dissemination activities, as described in the application form, the table will ensure to gather the information about dissemination activities during the project lifespan. - Evaluation form from the KoM: the partnership will use the same evaluation questionnaire for the future meeting in terms of general questions, each team can modify and add some additional questions. The hosting organization should propose and include the adequate questions, which will verify the indicators foreseen for his meeting content (as described in application form). - Evaluation terminology (glossary) will be uploaded to Dropbox. - For the future meetings: at least one person who attended the KoM from each team should also participate in other transnational meetings. - For the purpose of the final report it is important to keep any possible record to show the partners involvement into the project in their countries (to document the cooperation with local expert group and dissemination activities).